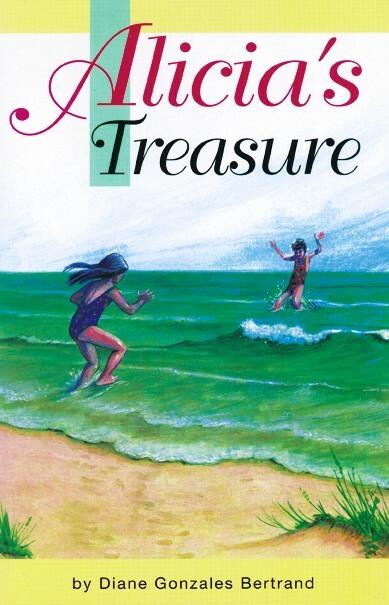 Alicia’s Treasure is the delightful tale of a young girl’s magical, fun filled journey of discovery to the sea shore. During the trip, Alicia finds out what trials and tribulations are in store for a kid sister tagging along with her brother and his girlfriend. Alicia resents having to share this vacation with her brother, since they usually argue about everything, but she knows that if it weren’t for him, she would be at home, not enjoying the beach. Alicia learns that reality is often different from expectations. Nothing is as she thought, from what she eats and drinks to sticky tar on a new bathing suit and sand castles that don’t look like those in the books or magazines. In the end, Alicia discovers the greatest treasures often are found in the most surprising ways. DIANE GONZALES BERTRAND is the author of several books for intermediate readers. They include The Ruiz Street Kids / Los muchachos de la calle Ruiz (2006), Upside Down and Backwards / De cabeza y al revés (2004), and Alicia’s Treasure (1996). A lifelong resident of San Antonio, Bertrand teaches at St. Mary’s University, where she is also Writer in Residence.